Thanksgiving was hosted by my aunt and uncle this year but there was no way I was going to show up empty handed. So in addition to the customary bottle(s) of wine, we brought spiced nuts and biscuits, of course. Line baking sheet with parchment paper and non-stick spray. Do not forget the spray or else you will have wax paper stuck to your nuts. No bueno. Mix ingredients all together in a bowl then evenly distribute onto baking sheet. Roast for about 20 minutes or until you can smell the almonds. Place a rack in the upper third of the oven and preheat oven to 400 degrees F.
Line a rimmed baking sheet with parchment paper. Grease the parchment paper with olive oil or cooking spray. Place almonds on baking sheet and toast for 10 minutes. 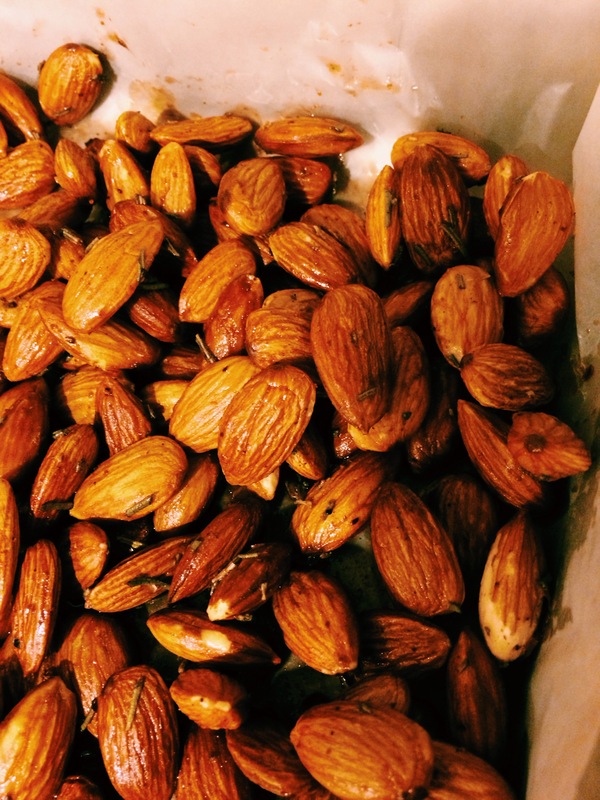 While the almonds are in the oven, in a small bowl, toss together cinnamon, nutmeg, cardamom, ginger, salt, and pepper. 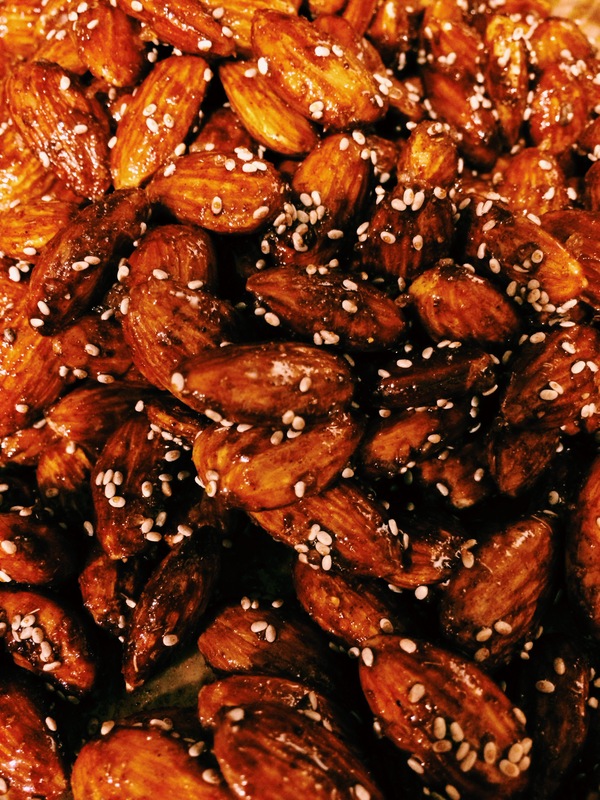 Remove the toasted almonds from the oven. Drizzle with honey and toss to coat. Sprinkle with the spice mixture and toss well to ensure that all of the almonds have a bit of spice. Sprinkle generously with coarse sea salt. And heck.. drizzle with a bit more honey if you’d like. Return to the oven and toast for 8 minutes. Remove from the oven and immediately trasnsfer the warm nuts to a plate to cool or jars for storage. The nuts will begin to harden as they cool and become difficult to remove. Store almonds in an airtight container for up to two weeks. 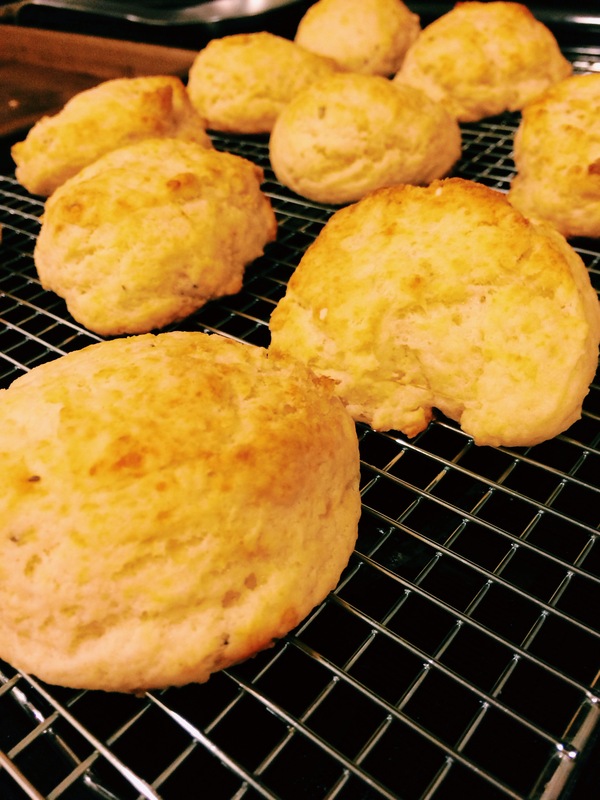 Drop biscuits are an easy way to make biscuits without the hassle of rolling out dough and cutting out the biscuits. 1. Adjust oven rack to middle position and heat oven to 475 degrees. Whisk flour, baking powder, baking soda, sugar, salt, Parmesan, and rosemary in large bowl. Combine buttermilk and 8 tablespoons melted butter in medium bowl, stirring until butter forms small clumps (see photo below). 2. Add buttermilk mixture to dry ingredients and stir with rubber spatula until just incorporated and batter pulls away from sides of bowl. Using greased 1/4-cup dry measure, scoop level amount of batter and drop onto parchment-lined rimmed baking sheet (biscuits should measure about 2 1/4 inches in diameter and 1 1/4 inches high). Repeat with remaining batter, spacing biscuits about 1 1/2 inches apart. Bake until tops are golden brown and crisp, 12 to 14 minutes. 3. Brush biscuit tops with remaining 2 tablespoons melted butter. Transfer to wire rack and let cool 5 minutes before serving.